Many books about the kamikaze attacks on American ships relate the history from a particular viewpoint or focus on a small piece of the total story. Denis and Peggy Warner succeed in their goal to give a more comprehensive perspective of the kamikaze phenomenon by relating the actions and reactions of Japan and the U.S. and by examining the reasons for Japan's suicide attacks. Australian Denis Warner worked as a war correspondent for the American forces in the central Pacific in 1944 and 1945. 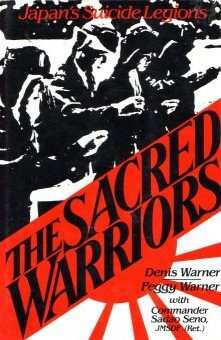 The direct journalistic style used in The Sacred Warriors places the reader in the middle of the action when the kamikaze forces attack. The book's many quotes by eyewitnesses provide fascinating individual viewpoints and help bring the terrifying events to life. Warner himself experienced kamikaze attacks, and he describes the aftermath of one of them when a Japanese plane crashed into the British aircraft carrier Formidable, where he was working as a correspondent. Chapters 5 to 15 cover the history of the kamikaze pilots from their beginnings in October 1944 in the Philippines to the last large-scale kamikaze attack on American ships around Okinawa on June 22, 1945. The authors present the attacks in chronological order, which makes the accounts easy to follow. However, many readers may tire with the overwhelming quantity of facts: ship names, dates, times, locations, Japanese plane names, casualties, officer names, and more. This information makes these chapters invaluable as a reference, but the descriptions of attack after attack make it a challenge to read the book from cover to cover. Japan's special attack units in World War II included much more than planes. The Japanese military also developed kaiten (human torpedoes), midget submarines, shinyo (explosive boats), and ohka (manned rocket-powered glider bomb). Denis and Peggy Warner chronologically weave the history of these other suicide attack methods with the well-known kamikaze planes. Some chapters, although interesting, do not belong in this book. The first two chapters cover the invasion of Saipan by the Americans. Although these chapters show the willingness of the Japanese people to commit suicide rather than be captured and illustrate the hopelessness of the Japanese military situation at this point in the war, they have little connection to the history of Japan's special attack forces. Since Denis Warner covered the invasion of Saipan as a correspondent, he must have felt compelled to include this moving account as part of a book on kamikazes. The last half of Chapter 16, "Preparing for the Holocaust," about biological warfare also has only a marginal relationship to the book's main theme. Chapters 3 and 4 thoroughly trace the origins of Japan's suicide attack operations. Many histories of the kamikaze pilots start when Vice Admiral Takijiro Ohnishi formed the first kamikaze unit in the Philippines in October 1944, but these two chapters explain that support and planning for suicide attacks began much earlier. In July 1943, a naval officer specifically recommended to Ohnishi that suicide plane attacks be used against enemy ships. In February 1944, the Emperor gave official sanction to the policy for the Army and Navy to develop and use special (suicide) weapons. Even before formation of the first kamikaze unit, Japanese newspapers and radios urged young men to volunteer for suicide attacks against ships and other planes. The evidence presented in these two chapters shows that Ohnishi's formation of the first kamikaze unit was not just a spur-of-the-moment decision to counter the heavy plane losses being encountered by Japanese forces, but rather the culmination of a policy that had much support from military leaders. The next to the last chapter gives an assessment of where Japan stood with special attack forces at the end of the war and what damage these suicide units might have caused if the U.S. had decided to invade the Japanese mainland. The last chapter describes the ultimate fate of the two principal kamikaze leaders, Vice Admiral Ohnishi by harakiri (ritual suicide) and Vice Admiral Ugaki by a final kamikaze attack right after the Emperor announced surrender. The Sacred Warriors has an extensive bibliography of both English and Japanese sources, which reflects the thoroughness of the authors' research in preparing this book. Denis Warner and his wife Peggy, who has collaborated with her husband on several works about Japan, conducted long interviews with Japanese survivors of the suicide squadrons and with American and Australian survivors of the suicide attacks. The authors also worked with Commander Sadao Seno, who graduated from Japan's Naval Academy in Etajima and was assigned to command a midget submarine, to provide readers with the Japanese perspective of the special attack forces assigned to suicide missions. The book's introduction lists the many people in the U.S., Australia, and Japan who contributed to the information found in the book. Appendix 1, "Kamikaze Score Card from May 1944 to August 15, 1945," lists the ships sunk and damaged by special attack aircraft including the ohka manned missiles. This appendix provides a valuable reference source, but the listing of ships sunk contains a few errors, including two ships listed twice as being sunk on different dates and a destroyer used after the war and transferred to Argentina's Navy. See 47 Ships Sunk by Kamikaze Aircraft for additional details on discrepancies in Warner and Warner's record of ships sunk. This well-written, meticulously researched book is a valuable addition to the library of anyone interested in the complete history of Japan's suicide attack forces.